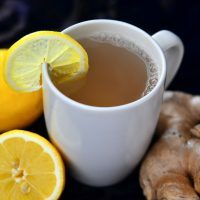 A hot cup of ginger tea can help you feel much better,even speed your recovery if you feel the start of a cold. Peel and grate (or slice)about a thumb knuckle piece of fresh ginger root. Infuse it two cups of water, simmer for 20 minutes. Double the recipe for four cups. Strain and drink a cup every few hours. The pungent components in ginger, gingerols, is anti inflamatory and helps fight viruses. Even better: If you can handle a little spice, add one-eighth teaspoon of cayenne pepper to one cup of your brewed ginger tea to help clear your sinuses.